Chalky Paint Colours: Antique White and Duck Egg Blue. 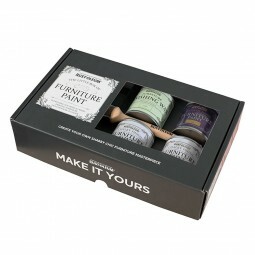 A great starter kit for anyone looking to try shabby chic effect on their furniture. 1 x 125ml Antique White Chalky Furniture Paint. 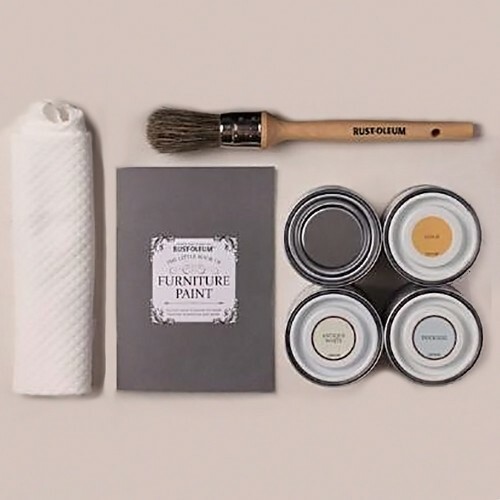 1 x 125ml Duck Egg Blue Chalky Furniture Paint. 1 x 125ml Clear Finishing Furniture Wax. 1 x 125ml Metallic Gold Paint. 1 x pure bristle paint brush. 1 x wax application cloth. 1 x 12 page booklet with hints and tips as well as project ideas. All this comes in a presentation box.